FeastHome – Blue is known for its calming impression. It is related to nature such as sky and sea. 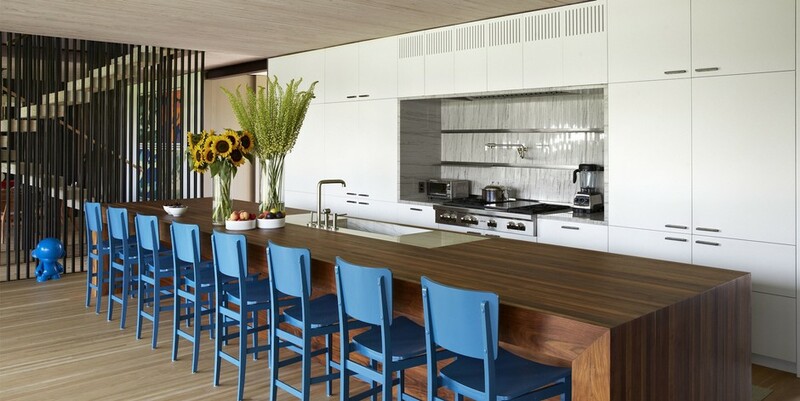 Applying blue color in your kitchen will make it looks bright and relaxing during your cooking activity. 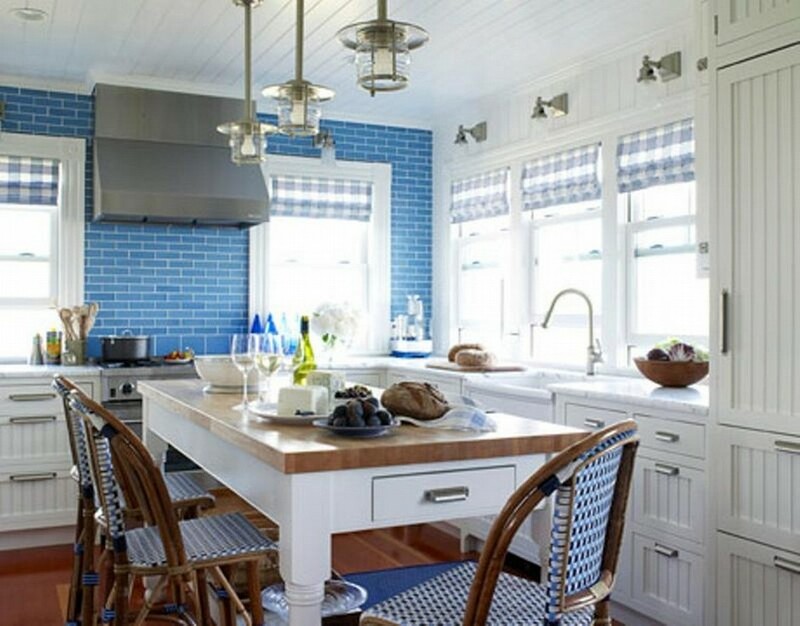 Follow these 10 ideas of a blue kitchen to have a bright and calming kitchen in your house. This kitchen combines blue and white that automatically makes it looks super modern and minimalist. The color combination makes this kitchen looks so bright and calm. The dining table becomes one with the kitchen table, which is a great idea to save some spaces in the area. It is also a great idea to accentuate a practicality. The white brick walls bring an industrial touch to this kitchen. And the hanging ball lamps make the modern style even stronger. Moreover, the wall built-in glass kitchen cabinets can be the wall decoration as well as displaying the tableware. The industrial style looks very strong by the use of blue brick walls, wooden dining chairs, and the hanging lamps. The blue color from the brick walls, white color from the kitchen cabinets and dining table, and natural wood color from the dining chairs blend very well. The householders play the patterns so well, the brick pattern from the wall and the plaid pattern from the wooden dining chairs. The installation of a few windows allows the natural sunlight comes through the kitchen, making it looks bring and more spacious. The next kitchen idea uses some artsy furniture. Look at the dining chairs and the hanging lamp. The householders use the statement furniture in order to make the kitchen looks artsy. The natural wood colors from the wooden dining chairs and wooden floor bring a warm atmosphere to this kitchen. Yet, it does not ruin the modern style. What makes this kitchen unique is, the kitchen cabinets are also used as a bookshelf. It is so practical so that the householders can easily take and read the recipe books. The dots pattern from the kitchen floor adds a playful touch to this kitchen idea. 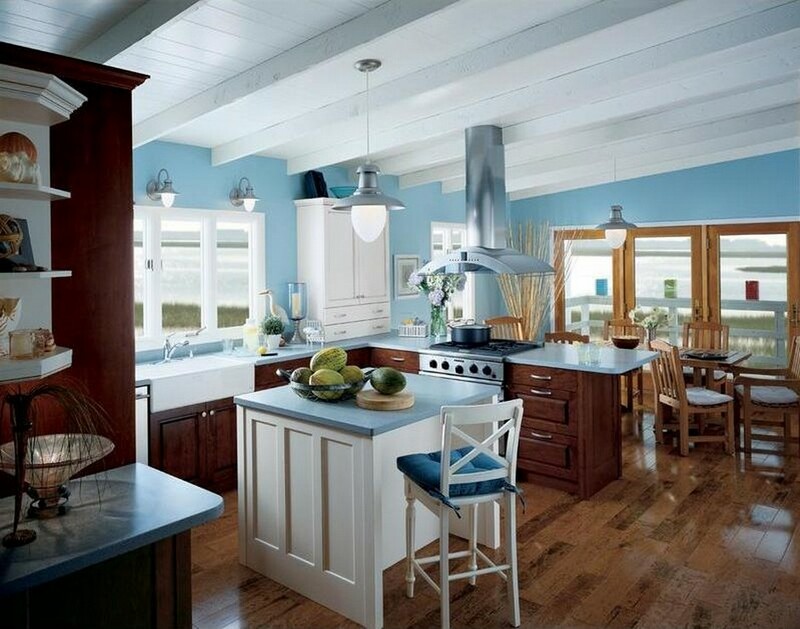 Moreover, the playful hanging lamps make this kitchen looks less boring because it only use 2 colors; blue and white. The grey color from the marble dining table also adds a color to this kitchen. The wall built-in cabinets are used to store the recipe books, once again, practicality is accentuated. The big glass cabinet is able to be used to store the tableware as well as a kitchen decoration. 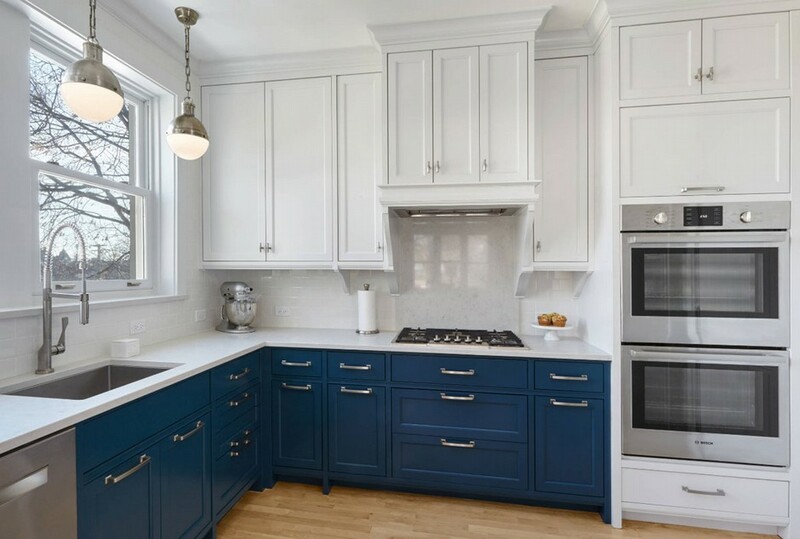 This kitchen looks very neat by the use of only 2 colors, white and blue. The neat arrangement of the kitchen elements such as cabinets and oven makes it looks even neater and cleaner. The clean atmosphere is also obtained because the white color is dominated the kitchen. The householders use blue only for the kitchen cabinets in the bottom part. For you who always want your kitchen neat and clean, you can apply this kitchen idea. The lighting of this kitchen makes it looks so fancy and elegant. Look at those artsy and fancy hanging lamps! 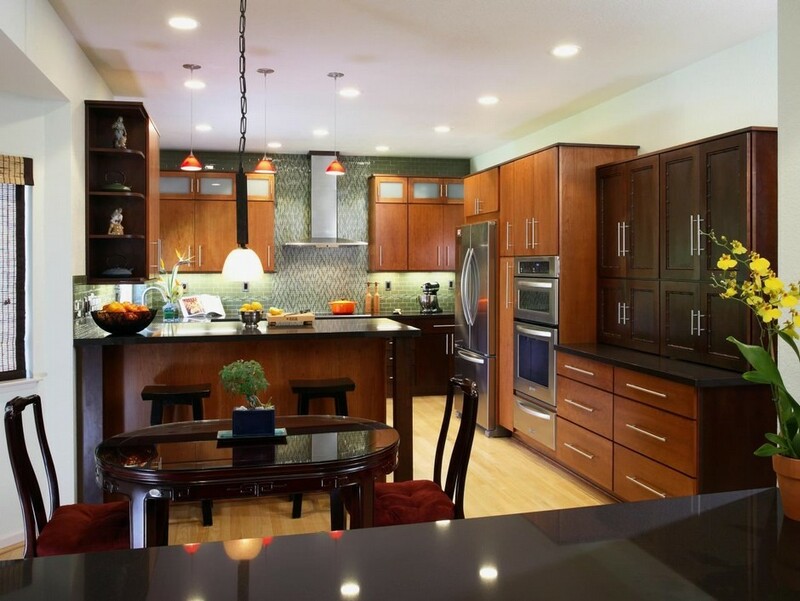 This kitchen also mostly uses the hidden lighting in order to accentuate the elegant look. The marble kitchen tables make the fancy style even stronger. 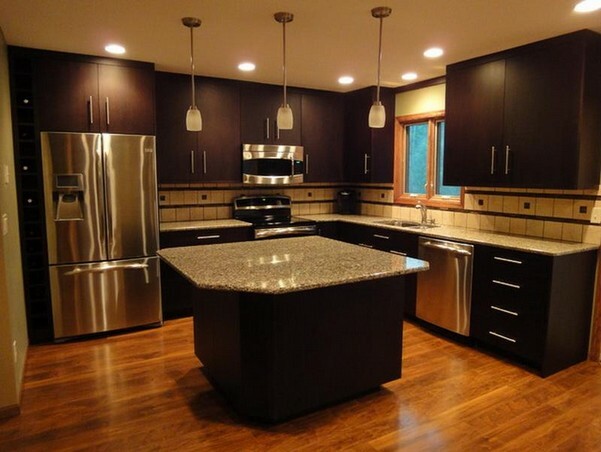 The wooden kitchen floor used cannot even change the fancy and elegant style of this kitchen. Once more, those family portraits make this kitchen feels so homey. Being in this kitchen will make you feel like you are in the bottom of the sea. 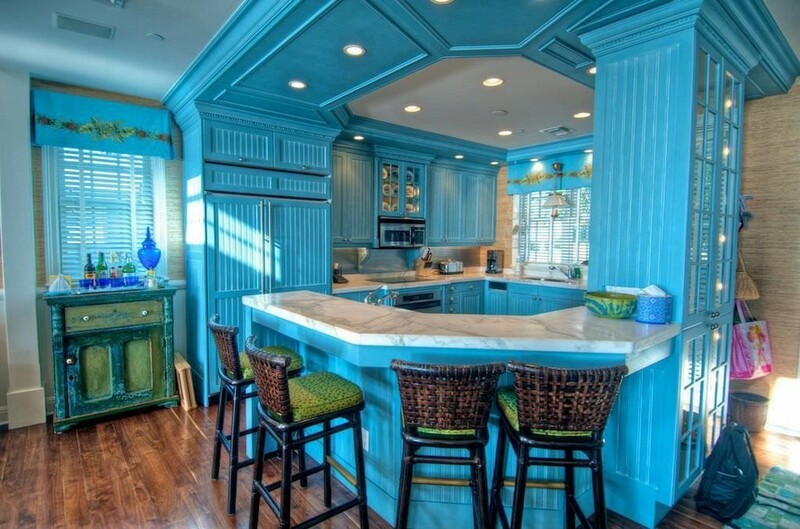 The aquatic blue color dominated this kitchen, making it looks like a fairytale place. The table outside the kitchen area even looks like it was a coral gotten from the bottom of the sea. Added with a lot of lamps, this kitchen looks even more dreamy. The rotten dining chairs add a color and unique twist in this area. If you want to make your kitchen to be at the center of attention in your house, this idea is very suitable for you. The householders use the blue ideas in a unique way. They only apply the blue for the dining chairs. The long rectangle dining table with a lot of chairs making this kitchen looks like a homey cafeteria for the family members. This idea is really suitable for you who love to dine with a big number. The sink is installed in the same place as the dining table, very practical in order to make it easy to place the dirty dishes in the sink. The use of big flower pots adds a sweet touch to this kitchen. This kitchen is so practical because of the arrangement. The arrangement is in a line without any twist. What makes this kitchen unique is the presence of a single kitchen table in the middle. Making the householders easily prepare the meals. 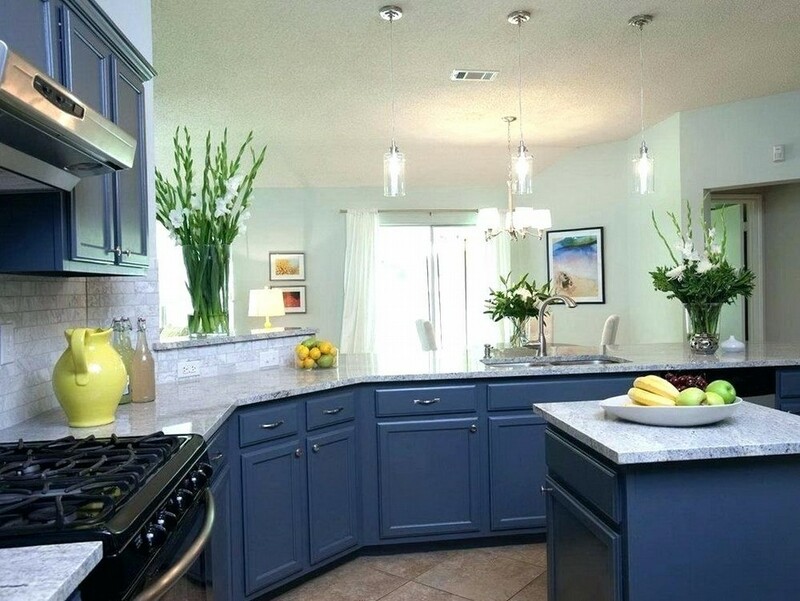 The dark blue adds a modern look to this area and those 3 flower pots make this kitchen looks sweet. The countryside style looks very intense in this kitchen idea because of the use of wood material that dominates the area. The natural wood colors make this kitchen looks very rustic. Making you feel like you are in a rural area. But the white and blue colors, and also the cooking hood bring a little bit of modern touch to this area. The light blue also makes this kitchen looks bright, since the wood material is already pretty dark. 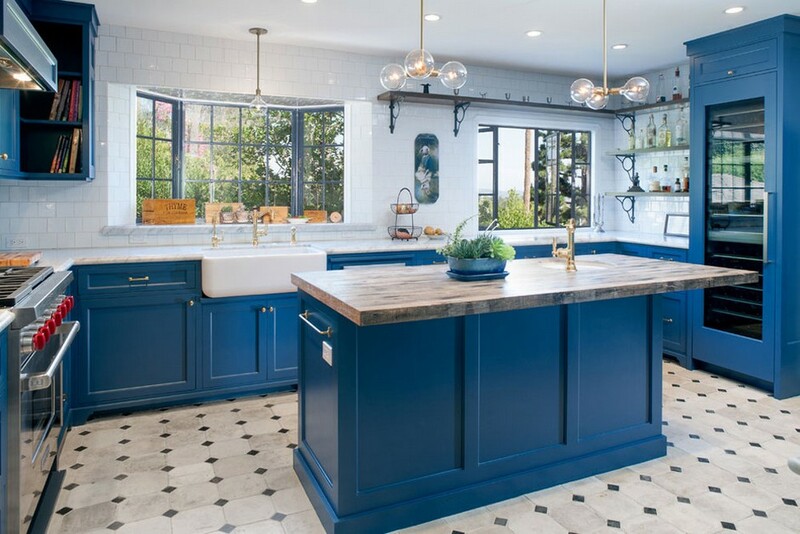 Those are the ideas of the blue kitchen for you who love blue so much. Blue is able to make your kitchen looks bright and modern, depends on the type of blue color you choose. This color is suitable if your kitchen does not have enough light. Moreover, blue is easy to be combined with other colors.